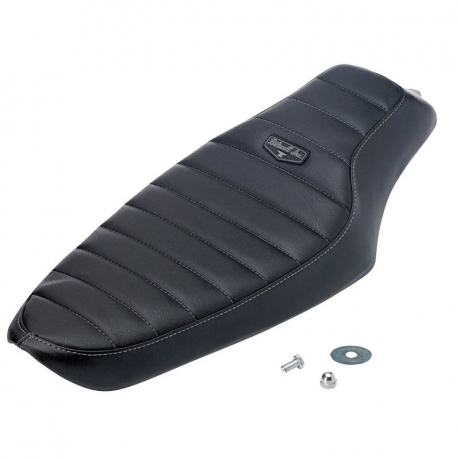 This black tuck 'n roll Biltwell Banana Seat will fit your 1986 - 2003 Harley-Davidson Sportster by simply drilling a single hole in your fender. Check out the Banana Seat Install tech tip to see how easy it is! These seats measure 22" long and 9" wide at the widest point. From the mouth of Biltwell: "We're reasonably confident the new Biltwell Banana seat will fit your 1986 through 2003 H-D Sportster perfectly. We qualify this statement only because we haven’t tested the Banana seat on every XL model manufactured during these production years. On the model years we DID work on, the Biltwell Banana seat looks awesome and fits even better. Of course, because this product is designed for custom, modified and garage-built motorcycles, we can't guarantee perfection in every application. However, if the frame on your '86-'03 Sporty is straight, if you haven’t modified or chopped the subframe and your rear fender is stock, the Banana seat should fit exactly like the production sample on the test mule in these photos." 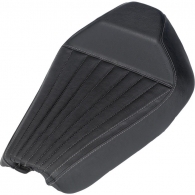 Challenger Seat- Black Tuck n' Roll - for '06 to -13 Dynas 5990грн. 14070руб. 210.00usd. 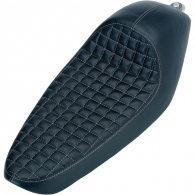 Cafe Seat - Checkerboard - for '86 - '03 Sportsters 5130грн. 12060руб. 180.00usd. 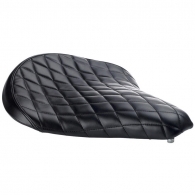 Solo Seat - Black Diamond 3710грн. 8710руб. 130.00usd. Cafe Seat - Tuck n Roll - for '86 - '03 Sportsters 5130грн. 12060руб. 180.00usd.